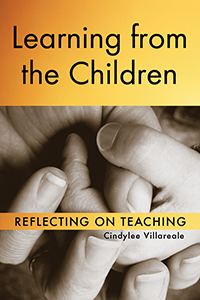 Cindylee Villareale has nearly 20 years of experience in the early learning field, including work with almost every aspect of early childhood education. She has been a teacher in classrooms for all early learning ages, a child care center director, a home child care provider, a mentor for early childhood students, and has been involved with Head Start. Currently, she consults for early childhood programs. As a teacher, you help children build their understandings of the world around them. Learning in the classroom is not limited to the children; your interactions with and observations of them provide lessons that are genuine and irreplaceable. This collection of heartening classroom stories, gathered over many years, reflects the change, growth, and learning that preschool teachers experience as a result of working with children. Stories are each followed by brief summaries of relevant theories and challenges that will promote your professional growth. Learning from the Children is an inspiring reminder that you learn from each child you teach.